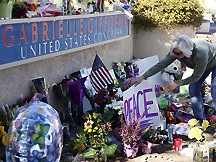 On Saturday January 8, 2011 a young 22 year old gunman went on a shooting rampage during a small political assembly outside a supermarket in Tucson, Arizona. The apparent target of the shooting was Congresswoman Gabrielle Giffords who was severely wounded with a bullet going through her head. Six people were killed during the shooting including a nine year old girl named Christina Taylor Green and U.S. District Judge John Roll. Thirteen other people besides Congresswoman Giffords were injured. Eight days later on Sunday January 16, 2011, Rev. Tony Ponticello addressed the congregation at the Community Miracles Center in San Francisco, CA. What follows is a lightly edited transcription of that lecture. The title of my talk today is, “Taking the High Road.” A Course In Miracles says, “Thoughts increase by being given away. The more who believe in them, the stronger they become.” (Tx.Or.Ed.5.8) What I’m talking about today is our thoughts, the thoughts that we all have. The thoughts that we have as human beings. The thoughts that we have as ACIM students. I’m probably focussing on this because we’ve been dealing with ideas about our thoughts while doing the first Workbook lessons. If you are doing the early Workbook lessons you know how tied in they are with the thoughts we are having and how we perceive things. Today’s idea, the one that we focused the meditation on is, “I have no neutral thoughts.” (Wk.Or.Ed.16) This is the idea that every thought has a charge. Every thought plays some part in the world that we see. In today’s lesson it said this, “The idea for today is a beginning step in dispelling the belief that your thoughts have no effect. Everything you see is the result of your thoughts. There is no exception to this fact.” (Wk.Or.Ed.16.1) We’re all A Course In Miracles students here. We’ve all been involved with the Course for some time. This idea is not foreign to anybody here. Somehow, everything that we believe and all the thoughts that we have result in this world that we see in some way. It’s hard for us to explain how this is happening? This is one of these ideas from ACIM that we must open ourselves up to. Different students relate to this idea very differently. Different teachers teach to this idea in very different ways. It’s been a hard week in relation to this thought. Last Saturday, a little more than a week ago, there was the shooting in Tucson. Six people were killed. Fourteen people were wounded. Congresswoman Gabrielle Giffords was shot in the head. She is still amir. She’s doing quite well considering the wound and brain injury that she has had. Nobody knows how much of a recovery she’s going to make. The shooting seemed to be politically motivated. It’s hard to know in exactly what way. It was a 22 year old man who did the shooting. It’s all very upsetting to a lot of people. It’s certainly upsetting to me to know that this kind of thing goes on in the world I seem to find myself in. Why this violence? Why this imagery? I look at last year. Last year was a very difficult time for me as well. A year ago right now, Rev. Larry was very, very sick. His sickness was a very awful thing to watch happen. Why? Why did I have that image in my mind? If I really take today’s idea and say that everything I see is the result of my thoughts then somehow all these things, the shooting in Tucson, Rev. Larry going through such a seeming awful sickness, is a result of my thinking. That’s a very hard idea to accept. Sometimes I can accept that the difficulties I see going on with me are the result of my thinking. When I open up to the idea that all the difficulties that seem to be in the world, all the shootings, the illnesses, the wars in other parts of the world – somehow that’s all the result of my thinking – that’s a very difficult idea. A Course In Miracles keeps hammering this idea home to us, “... salvation requires that you recognize that every thought you have brings either peace or war, either love or fear.” (Wk.Or.Ed.16.3) The Course keeps talking about this again and again in many different ways. Let’s think about the Bible. Does the Bible mean exactly what it says? Does this mean that the earth was created in six days. That’s what the Bible says. Are we supposed to think that the six day creation story is literal? A Course In Miracles just told us the Bible means exactly what it says. Are we supposed to think that Noah built an ark, then there was this huge flood, and somehow Noah managed to get two of every kind of animal on that ark? How could that be real? He couldn’t have gone to all parts of the world to get all the different animals. There’s no way all the different animals could fit in any boat. Such a boat would need to be incredibly huge. Where would he store all the animal food. What would he do with all the animal manure! What about a male and female of each insect? This Noah’s ark story has to be just a myth. It can’t be the literal truth. Yet the Course says that even the Bible means exactly what it says, but it did give a caveat, “... if it is properly understood.” (Tx.Or.Ed.8.86) We have to understand what the Bible is saying. There is an interpretation part that is going to enter into it. We don’t have to accept that the world was created in six days, although many fundamentalist say that we should. We don’t have to accept the fact that Noah built this big boat and put all the animals in it, two by two, even though there are some fundamentalists that still believe that. What we have to do is properly understand these stories. If we have to properly understand these stories then there is a lesson we learn from that understanding. We could relate to A Course In Miracles in the same way. If we do, it does open up the idea that maybe the Course isn’t quite as literal as we think. Maybe we have to understand it properly for it to have a correct, literal meaning for us. This changes a lot of things. If we’re supposed to relate differently to the earth being created in six days and Noah building an ark, then how are we supposed to relate to the story of Jesus? We have this man who we think was a great teacher. Then his body died, and three days later his body rose from the dead. Somehow we’re supposed to accept the Jesus story as literal, but we’re supposed to relate to the story about the six day creation of the world as a symbolic myth. Wouldn’t it be possible that the story about Jesus’ body physically rising from the dead is also a symbolic myth? Maybe we’re not properly understanding the Jesus story. We have to properly understand the Bible. Maybe we are not properly understanding the Jesus story when we relate to it absolutely literally. I don’t know the answer to the question of how to relate to the Jesus story. What I am saying is that when I read about Jesus in the Bible now it does raise a certain question. This question then leads me to what does A Course In Miracles actually mean when it tells us that we should relate to ACIM as literal? Is the Course literally true all the time? A Course In Miracles says, “There has been much confusion about what perception means because the same word is used both for awareness and for the interpretation of awareness. Yet you cannot be aware without interpretation, and what you perceive is your interpretation.” (Tx.Or.Ed.10.60) Okay. The Course is saying that it uses the word perception both to mean the things that we are physically aware of and our interpretation of those things. I am aware that there is a chair here. I am aware that there is a songbook on the chair. That’s my perception, but I have an interpretation of this as well. I am aware that there are those songs in that songbook. Some people like some songs. Other people like different songs. Some people can sing the songs well. Some people can’t sing the songs very well. Sometimes we sing the songs with a pianist; sometimes we sing the songs without the pianist. When we sing without the pianist we don’t sing as well. So, I have all kinds of interpretations about what that songbook means. How about that chair? Well, there’s nobody in that chair. There’s not that many people here for service today. What does that mean about the Community Miracles Center? What does that mean about me? These folding chairs have been here for over 20 years. A lot of them have been falling apart lately. We have to go out and buy new chairs. We have people who rent this room. Sometimes the chairs just collapse! That’s certainly not a good thing. We might get sued! That’s all my interpretation of looking at the chairs. I’ve got all kinds of thoughts about the chairs when I think about it. When A Course In Miracles says, “perception” it means both of these ideas. It means how I am interpreting the thoughts I have about the chair, and it also means that I am just aware of that chair. It means both. Perception is a debatable idea in the Course. We Course students can talk about that for a long time. What does perception actually mean? The Course says, “Let us be glad that you will see what you believe, and that it has been given you to change what you believe.” (Tx.Or.Ed.31.31) I believe that chair is there. I believe that it has these many interpretations for me. I am seeing it, interpreting it. I can change how I interpret it so I can change how I see it. If I can change how I interpret the chair, the chair will be different for me. Does it mean that the chair might not be there? Does it mean that I will just interpret the chair differently. Maybe I will have a different feeling about the chair. These are the theological debates that ACIM students have all the time. I have lined myself up on different sides of this debate from time to time. Now, in my 30 plus years of studying the Course, I’m backing away from the debate. The truth is that debate can go on forever, and it probably will go on forever. For as long as there are Course students we may be talking about this kind of thing. These debates just catch our minds and waste time. I sometimes believe that I live in this violent, insane world. Wars get waged. Guns get sold. A congresswoman gets shot. People around her get shot and killed. I can believe that I can change the way I look at that and have a different view of that. That change is at least a starting point. Will my change in the way I look at those things mean that they won’t happen, or will my change mean that I will interpret those things differently so they won’t bother me that much? Maybe there isn’t any difference between those two things. A Course In Miracles says, “Thoughts increase by being given away. The more who believe in them, the stronger they become.” (Tx.Or.Ed.5.8) I started this lecture with this idea. How I think about whatever it is, war, the shooting, the chair, the songbook, ... it’s very important because as I share the thoughts I think they get stronger. Which thoughts do I want to strengthen in my mind? Do I want to think that we have a violent world? Do I want to think about what’s wrong with us that we have war? Maybe I want to take a different perception. I want to offer these things up to the Holy Spirit and ask for a different perception I can be more at peace with. Of course this is what I want to do because that influences the whole world. Whatever we believe something to be influences the whole world and everybody else. If we can keep ourselves at peace everyone else has a greater ability to stay at peace. When the shooting in Tucson happened I was very tempted to believe the liberal point of view, the liberal political interpretation of that shooting. What that was is the conservatives, the Tea Party people especially, have created such a poisonous buzz about Second Amendment rights and guns that it has caused this shooting to happen. We have Sarah Palin and all her rhetoric about “lock and load” and all the other gun metaphors that she uses so often. We have had Sharron Angle, a conservative Tea Party candidate from Nevada, who spoke of “Second Amendment remedies.” If the government remains tyrannical, as she sees it, the people will have to use their second amendment rights, to what – to overthrow the government? Do we had a political candidate who actually was talking about overthrowing the government? Let’s look at the Second Amendment. It says, “A well regulated Militia, being necessary to the security of a free State, the right of the people to keep and bear Arms, shall not be infringed.” What’s our perception of that? What’s our interpretation of that? That’s an odd one. I heard an interpretation that this means that the people would always have to have the gun power to overthrow the government. That’s how many people interpret the second amendment. I saw a political pundit saying that this interpretation must mean that people should have nuclear weapons because the government has nuclear weapons and if USA citizens have to have the firepower to overthrow the government the people would have to obviously be armed as well as the United States government. Wouldn’t that mean that the citizens would have to have nuclear weapons if this is how the Second Amendment is interpreted? Sharron Angle quoted Thomas Jefferson as saying that there should be a revolution about every twenty years. Does this mean that we should advocate the violent overthrow of the United States government? We the people would have to be able to take on the United States militia. What an idea that is. The interesting thing about all of this political debate around the shooting, for me, was that when President Obama got up to talk at the memorial he took a truly high road approach. He didn’t get into any of the politics. He told people not to get into any of those political discussions. He told people not to put the blame on anybody. He said that we should enter political debates with the patriotism and the innocence of Christina, the nine and a half year old girl who was shot and killed. President Obama quoted things about what the little girl believed and what idealism she had about government. That’s part of the reason why the little girl was there at this Tucson gathering. President Obama asked us to have the innocence and the idealism of this nine and a half year old girl. He didn’t get into any partisanship at all. The President’s address, his eulogy, was highly praised. I’ve never heard anything else that Obama said that was this highly praised. Even the conservative pundits were praising the President. Even the most conservative and most unlikely ones were praising President Obama. I saw and heard Glenn Beck praise President Obama’s eulogy. I almost gasped. Even more amazing, I saw and heard Rush Limbaugh praise Obama’s speech. Wow. That was truly a miracle. (laughter) That was really a shift in perception. I never thought I’d see something like that! These are people that have called him the devil, the Muslim devil. These conservative commentators have called him all kinds of things. Yet there it was. I was seeing it with my own eyes and hearing it with my own ears. Glenn Beck and Rush Limbaugh praising President Obama. It was amazing. Wow! Obama took the high road. He truly took the high road. He could have gone into the liberal point of view. He could have used the shooting as a rallying point for gun control. He didn’t do that. He just talked about the innocence that we all should have, the patriotism that we all should have. Our political discourse should reflect that. He got unprecedented praise for this approach. I can relate this to the debate that goes on in the A Course In Miracles community about how literal to take some of these metaphysical Course ideas. Are we really manifesting the world or is the Course just talking about our perception or interpretation of the world? Maybe we shouldn’t be taking sides on this debate. Maybe we could truly take the high road about this debate and step back from it. Let it be. Let the people take sides if they want to. I’ve taken sides in the past. What I am coming to is that maybe it is better for me not to take sides. It’s better for me personally. The Course says, “Ideational preoccupations with problems set up to be incapable of solution are also favorite ego devices for impeding the strong-willed from making real learning progress.” (Tx.Or.Ed.4.77) These debates, both political and spiritual, are preoccupations that us ACIM students have and they are incapable of solution. There is no way we can solve these questions. There is no winning this debate. There’s no way we can solve the question of whether Jesus was a true historical person. There’s no way we can know if his body actually rose from the dead, but we can get caught up into thinking about that. There’s no way that we can really know if our thoughts are actually manifesting this room, these chairs, that curtain, or if the Course is just talking about our interpretation of those things. A correct Holy Spirit guided perception would have the effect of bringing us to peace. We could debate all these things from here to the end of time. In another place in A Course In Miracles it says something very similar to the previous quotation. “Theological considerations as such are necessarily controversial, since they depend on belief and can therefore be accepted or rejected.” (Cl.In.2.4) The Course debates are around theological considerations. They are theory considerations. They are controversial by definition. They are necessarily controversial because they can be believed, or they can be disbelieved. One can line himself up along a certain camp. We can say my belief is the right way to look at it. We can say that the other belief is the wrong way to look at it. ACIM students have been doing this as long as I have been involved with the discipline. This teacher’s interpretation is the right interpretation. That teacher’s interpretation is the wrong interpretation. Liberals and conservatives do it. The conservative point of view is the right point of view – if you’re conservative. The liberal point of view is the right point of view – if you’re a liberal. If you are a liberal, the conservative point of view is awful. It leads to gun violence and death. If you are a conservative then the liberal point of view is awful. It leads to all kinds of oppression, tyranny, big government, socialism, communism .... It just goes on and on and on. I think we are being asked to take the high road. We need to take the high road in how we think about the world. We need to take the high road with how we think about ACIM. I could blame the conservatives and all their gun rhetoric for causing the shooting. I could take the fundamentalist A Course In Miracles perspective that I am manifesting the world and that it isn’t the conservatives fault. It’s my fault. The blame that used to be out there, now I take within. What’s wrong with me? What wrong with my thinking that is causing me to manifest this tragedy? What I believe ACIM is telling me is that the idea of blame and guilt is what is wrong. It doesn’t matter whether you are blaming them and trying to make them feel guilty. It doesn’t matter whether you are blaming yourself and trying to make yourself feel guilty. It’s guilt itself that is the problem. It doesn’t matter at all where you are placing guilt – within you, out there. It really doesn’t matter because it’s the same idea. This is what I have come to in my 30 plus years of studying A Course In Miracles and relating to the controversial ideas in it. I don’t feel that I have to take any particular stand. I certainly should be as able to have discussions with the people who have one particular viewpoint as I am to have discussions with other people who have another particular viewpoint. I think what we do here, at the Community Miracles Center – at our Sunday Service, through our publication Miracles Monthly, through our web site, through our conferences – is about bringing people together with all the different viewpoints hoping that they all feel comfortable within the space and the energy that is created by the Community Miracles Center. We also attempt to create this with our classes. Everybody should feel comfortable having whatever perceptions they have of the Course and they should not try to make anybody wrong, not make anybody bad, not to have any guilt or blame on anybody. Everybody can have whatever interpretation they want. This article appeared in the January 2011 (Vol. 24 No. 11) issue of Miracles Monthly. Miracles Monthly is published by Community Miracles Center in San Francisco, CA. CMC is supported solely by people just like you who: become CMC Supporting Members, Give Donations and Purchase Books and Products through us.